I'm Kelly from The Essence of Home and I am Kim's younger sister. I am so thrilled to be able to share my favorite room on her blog today! I love this new series that she is starting. I am going to look forward to seeing everyone else's favorite rooms too. My favorite room is ................ my family room. The reason it is my favorite room is because it means I get to relax in here. I like my kitchen too (which I thought about featuring instead), but honestly, that is where I work! So...........the family room wins! Ha! I've kept it neutral and haven't grown tired of it. Usually, (I'll confess) it's not this neat. At night, we all convene in here and watch TV, look at the laptop, read, and play with our dog, Max. It's not a very large room, but a lot of time is spent in here. Luckily, we had this room opened up to the sitting room (or living room, you could call it). That helped tremendously! We love to use our fireplace in the cooler months. Since my husband is a firefighter, he prefers a real wood burning fire. No gas logs for us! Ha! 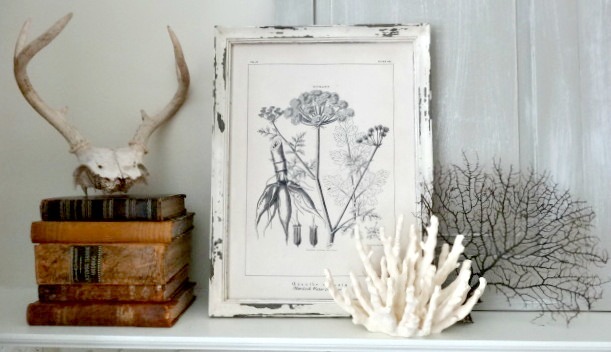 I've decorated the mantel with nature inspired objects and vintage leather books. I love to decorate with flowers too. I have always loved them (real or fake). I also love to decorate with white dishes. They are everywhere in my house! I displayed several in this glass cabinet. Old book bundles and baskets are another love of mine. Since I don't have built-in bookcases and shelves in my family room, storage is at a premium. I've used this antique chest of drawers to help with that problem. 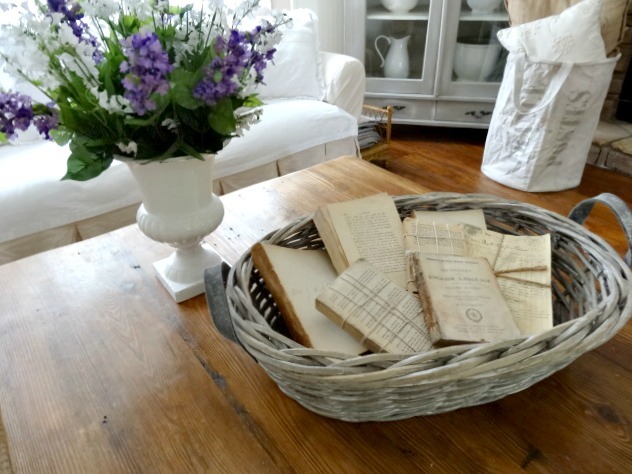 A white platter on top of books and old blue bottles create a soft colored vignette. 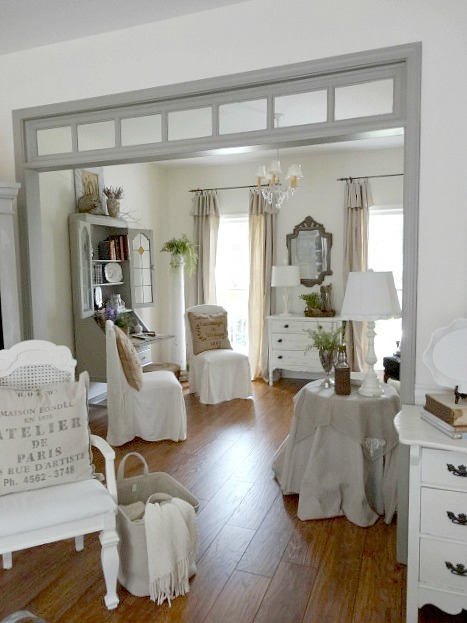 One trick to making the room feel larger is using a large leaning mirror. It bounces light around the room and makes a decorative statement too. And don't let all the white slipcovers scare you! I live with 2 boys, a husband and a dog. All of these slipcovers are machine washable. The coffee table is made of old Irish pine and we even put our feet up on it! The sea grass rug underneath is very durable and the hardwood floors are laminate and easy to take care of. I don't want anything in here that can't be used and enjoyed. This room is where we end our day before bedtime and have made some wonderful memories as a family. I guess that's why it's called the "family room". Thank you, Kim, for allowing me to be your first guest post with your new Favorite Room series. Thank you, Kelly for starting off this series. I do love this room and I am lucky to get to visit it in person occasionally. For those of you new to Kelly's blog I hope you will pop over and look around at all her other pretty rooms. I can totally see why this is your favorite room Kelly. It is beautiful! Thanks for sharing Kim...I am going to enjoy this series too! What a beautiful room! I cannot believe she has two boys AND a dog!! Que casa maravilhosa. Eu gosto de branco. Minha casa é muito escura. Me encantei com seu quarto. Tenha um ótimo fim de semana. I love the serene atmosphere the neutral colors present. 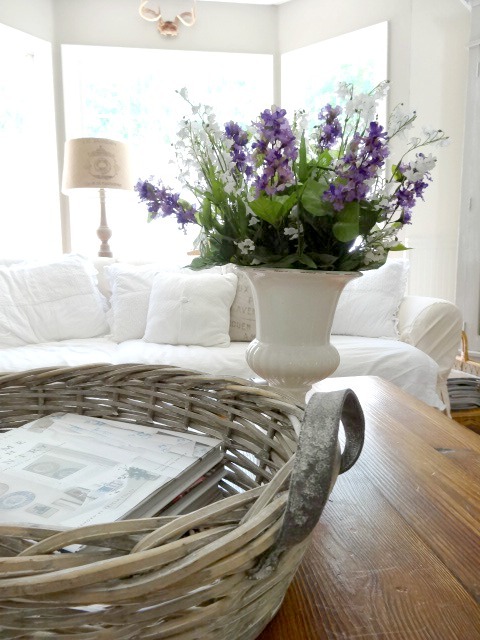 The organic accessories really add some nice texture and balance to the room.Beautiful! Such a calming and serene room. 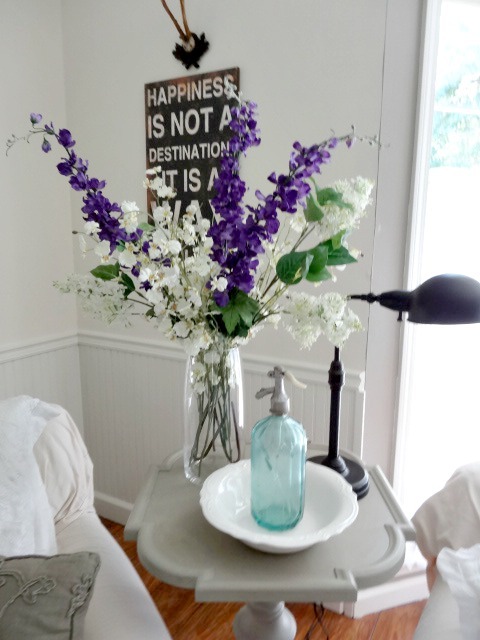 Great idea on the leaning mirror and the pops of purple in the arrangements really stand out. Looking forward to more of this new favorite room series. Hats off to Kelly for a perfect first "favorite room" post! I live with two boys, a husband and a dog too. My question is, "where's the TV?" I really love your room too. 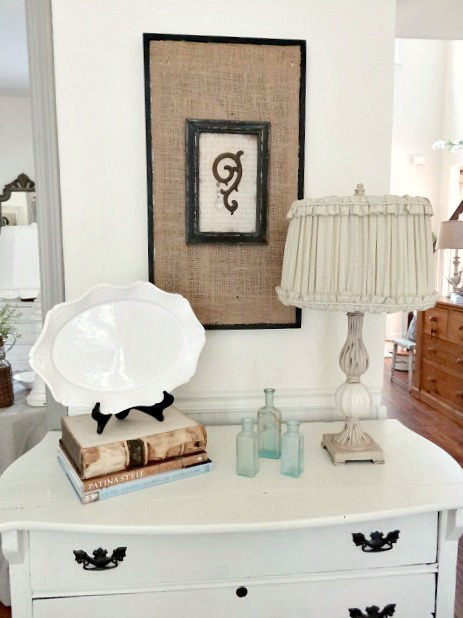 You've done a great job of creating a warm and relaxing space and I love the white platter on the black stand--so simple I didn't think of it, but I sure can copy the idea! Thanks for the inspiration. Absolutely beautiful! 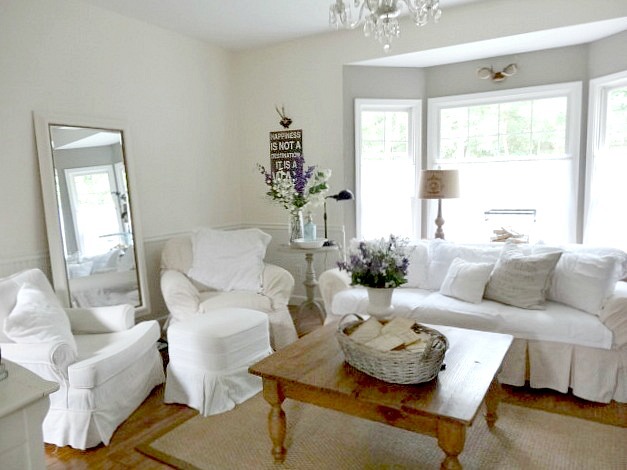 Also amazing that you can have a white fresh room like that for a family room. I agree with you totally on being able to use and enjoy all the rooms in your home. Kelly I can see why this is your favorite. It is beautiful!! I love how it opens into the living room. I love that idea and I love the wood burning fireplace! Kelly, I could relax in this room too. But first it would take me awhile to admire all the beautiful things you have. You have a flair for decorating. I am now ready to fold up my pattern persian rug and go for a sisal or something neutral. I think I would like that but am slow to change. I think Kim's idea is great. Glad you were the first participant. Kim, looking forward to more favorite rooms. 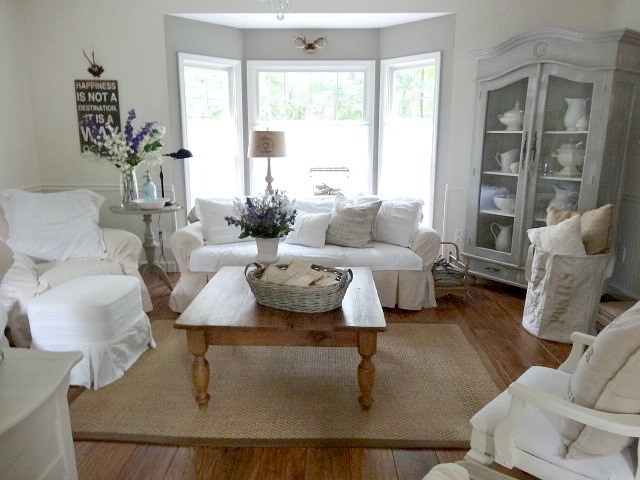 I love Kelly's all white room, especially with the natural wood coffee table. You have quite an impressive blogging and decorating family! Very pretty and very relaxing. Great style runs in the family! Yep good design genes certainly run in the family! Kelly's living room is beautiful! Kim, This is a great series!! I have always loved Kelly's home!! Such great style!! Just gorgeous!! Can Kelly jump on a plane and come decorate my home? I just love it! Such a beautiful room! It is definitely a favorite of mine too! The white is so crisp and refreshing! Kelly and Kim you both are so talented! It's a joy to visit your blogs! Congrats on your first guest post, Kelly! Super job! It's a beautiful room, Kelly, and I think it's my favorite in your house, too! Thanks for sharing all the details! You know I LOVE your style!! Your home is gorgeous.Thank you for sharing it and inspiring me! what a beautiful space! thanks for sharing. Your family room is wonderful - which is no doubt because your entire family has awesome taste. What a stunning room .it inspires me so much. I love the armoire filled with white China. Have a great weekend ladies. so light and bright. I can see why it would be your favorite. You have it decorated so well too. Gorgeous!!! 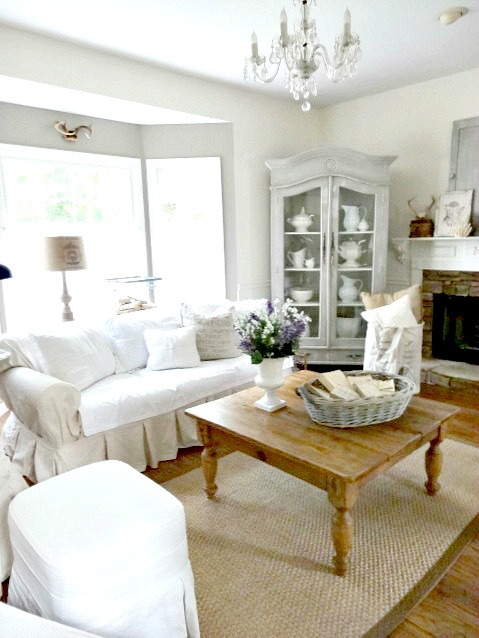 Your family room is my favorite room....so light and airy..... and serene :o)Simply stunning! Of course, talent runs in families. 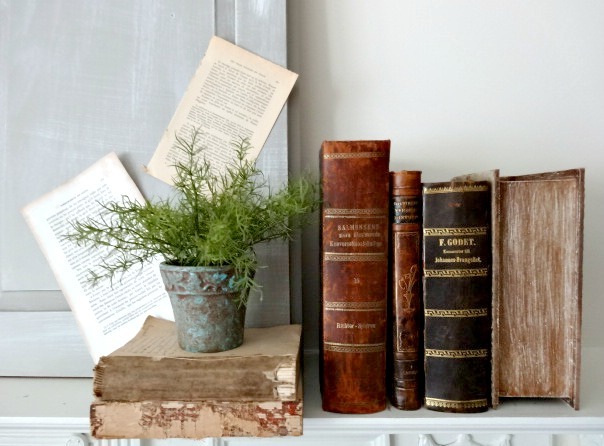 I've followed Kelly from her very first days of blogging, and her spaces are just lovely. I'll bet y'all have a good time when you get together! Kelly your home is wonderful, and I've loved seeing the subtle transformations you've made since starting your blog. You and Kim both have such wonderful style! Kelly, you have a beautiful family room. It is calm and relaxing looking. I can see why it is your favorite room. Kelly's family room is so beautiful! !She has wonderful style.It's so airy, and pretty. Wow Kelly, I can see that "style" runs in the family. It is a neutral room but all of the personal touches give this room so much warmth and personality. It's beautiful, Kelly! I do love all your white slipcovered furniture, but I don't think we could handle all that whiteness -- I'd be washing it all the time! We live "large" & "messy" -- just saying! I really love all of your pops of color against the white -- casual chic at its best! Hi Kim, I love Kelly's home and I am a big fan of her blog! I can see why this is her favorite room...beautiful. Stunning room Kelly. I love that the coffee table is not painted. It really pops and warms the room right up...along with that fireplace. :o) All your touches are wonderful. This is going to be a great series Kim! I love Kelly's home and style. Her family room is my favorite too! I love her fireplace with all that pretty stone! Jaw-dropping gorgeous and absolutely magazine worthy! 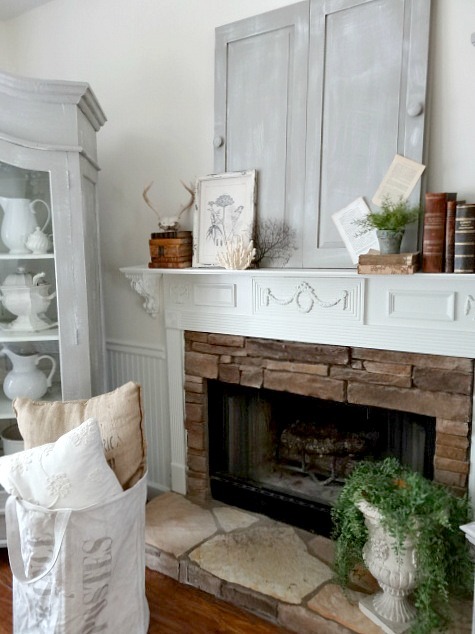 Love all of the natural elements surrounding the fireplace! Just the most fresh airy room, Kelly! YOu and your sister have such a way with decorating! This would be my favorite room too! 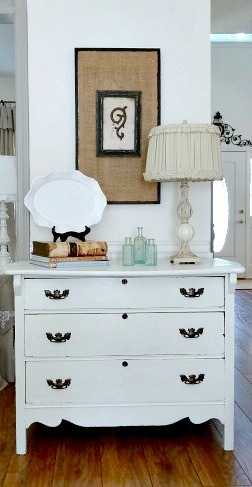 I love the great white dresser! Beautiful room. Som light and airy. Great series idea, Kim! Hi Kimmie! How sweet of you to feature your sister's lovely family room! I enjoy her blog too! You two sister's really know how to decorate! OK Kelley...you're giving me the courage to try WHITE slipcovers! Now before i change my mind, can you tell me where you got yours? Very warm and stylish. I love both of your homes! Thanks for starting out your new series with Kelley's favorite room. I have to repeat what other folks have posted - you both are so talented! I can see why this is your favorite room. Now you have me curious....I want to see your kitchen. what a beautifully designed room, kelly! tfs:) now, i'd love to see the kitchen! LOVELY post , thank you Kim and Kelly! Enjoyed this input tremendously,I love your well planned room and the white of course! I relate to the practicality of white slip covers and do the same, even the afghan hound's favorit daybed has a white cover since it is the easiest ever to keep clean and fresh! Such a beautiful room. I just got a coffee table somewhat similar to that one and this is how I want to eventually decorate my living room. I love this room. I think in honor of the "older" sisters new series I'm gonna pick out my favorite from the favorite rooms featured. So in Kelly's room.... I pick.... the .... firefighter. No wait he's not pictured. Ok I pick the armoire filled with white. But when she starts repainting and repainting her mantel I'm gonna stage an intervention for you both. Such an inviting room. Love your style. Kim and sister Kelly,your sunroom Kim is so inviting and comfy,your family room Kelly is charming.Thank you ladies for sharing. Such a beautiful family room! I LOVE the slipcovers-Would you mind sharing where you got them/had them made? Stunning! Kelly has made me a fan of white!!! Good luck with your new blog..I'm looking forward to the next post. This room is so gorgeous and Kelly photographed it just beautifully! I can see why it is her favorite and it looks like it belongs in the pages of a magazine. Fantastic new series Kim and you and Kelly obviously share incredible talent! It's nice to see that you have your own unique style. I love it. You and your sister have a really good eye! Best of all, it's great that everything is not only pretty but "user friendly"! Oh, mercy, Kelly, this is just a dream room. I love it so much. Kim, what a great series idea! And Kelly, what a gorgeous room! I see you and your sister share a love of pillows ... and I've spotted quite a few spots where that Union Jack pillow will fit in perfectly! Great space. Like the pops of color with the flowers. The stone around the fireplace is pretty as well. 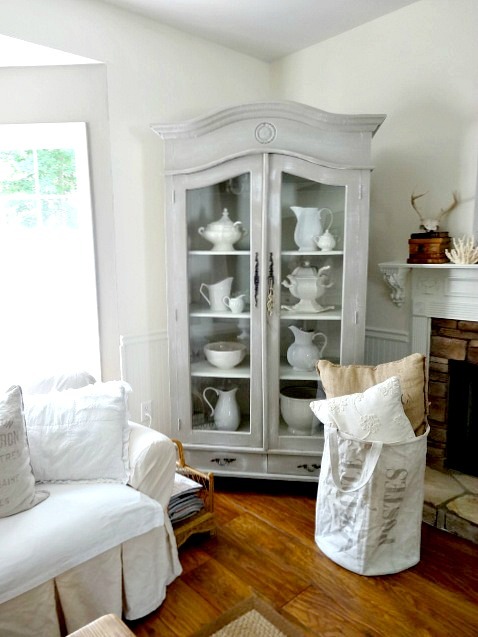 Love all the white pieces in the hutch. What a beautiful space for you and your family. And it's all washable!!!! How great is that! Everything pops with the white in the background. So, so clever and smart. Love it. Kelly,I have always love you style and this room is no exception. It belongs in a magazine. I love our gorgeous home Kelly! I'm doing a neutral room right now and this is total inspiration. This really should be published!! Love your family room! 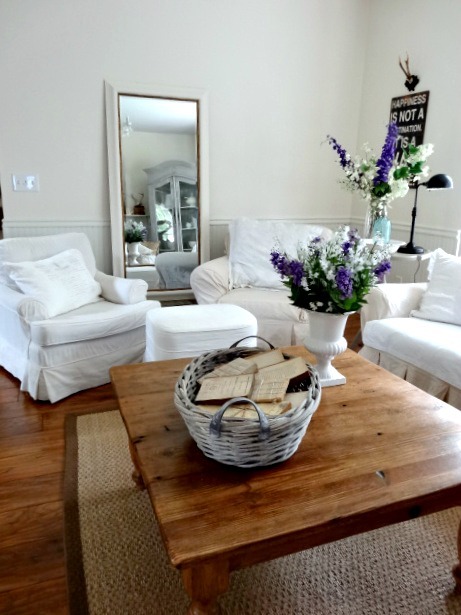 Love the white slipcovers and contrast with your wood floors. Love the book bundles too! I love Kelly's gorgeous family room! It looks like it came straight out of a magazine. What a fun new series... I can't wait to see all of the beautiful rooms that will be featured. Beautiful room. Thanks for sharing Kelly, adore your blog, and thanks for posting Kim. I too live with 2 boys, a husband and a rather large chocolate lab. Such a calming atmosphere... Can't wait to see the rest of the rooms. Kelly, Your room is so fresh and pretty and just proves that a beautiful room with white slip covers can also be practical for family living. Nice job! Oh Kelly...this is my favorite room in your home too..You have created such an inviting room for your family to gather. Your room is so casually elegant with the practicality of the activities of your active family!....You are the sweetest!! Kim - I can see style runs in the family! Love Kelly's peaceful retreat - the bundled books, the blue bottles, the giant leaning mirror. Lots of fabulous here - I can see why it's her favorite room! So pretty. Love all the white. What a nice feature. I enjoyed the tour! Beautiful! A very warm and friendly room. Loved the mirror! You both are very talented. Love your sisters home. Kim, what a great idea for a series! 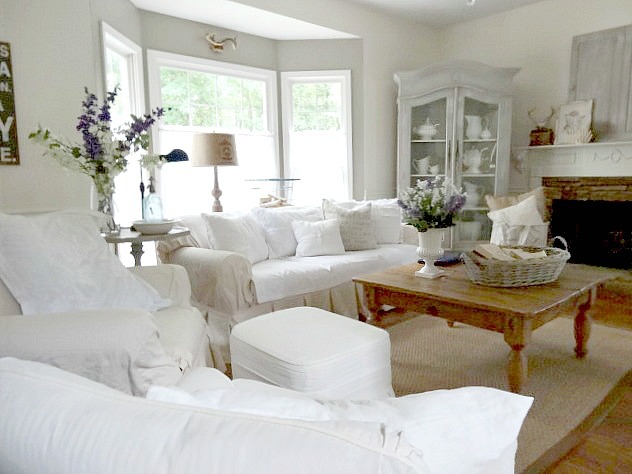 I had seen Kelly's beautiful family room on her blog, but I really enjoyed seeing it again. Ditto to all the comments about the fact that you two sisters really know how to decorate! What a gorgeous space! I love everything about your home! Thanks for sharing! I love nature inspired mantle. Overall, it is a gorgeous room! I love it! That room is gorgeous. Lovely, comfy, cozy....the list goes on. Just found your blog. Very Nice! Kelly and and Kim, I'm back for another look tonight for Kim's Top 10 post. Love looking at this serene room with all the white and natural wood. Loving the cabinet full of ironstone!